Children today are dangerously lacking in many vital vitamins and minerals. Why? Perhaps because we spend so much time indoors playing video games and watching television. Or maybe its because we are a microwave nation… rushing to grab a fast meal on the go at the sacrifice of our health. Maybe its the over abundance and cheap accessibility of processed foods filling nearly every American pantry. The deficiency of necessary vitamins and minerals coupled with the addition of chemical colorings, preservatives and flavorings directly relate to the increase in disease and behavioral issues. As caring parents, we all want the best for our children and that means getting these vital nutrients back into our children’s body. Here’s some easy tricks! Stay with us after the jump for a delicious recipe that is full of nutrition and the kids will eat it! Tuna (3 ounce portion) 200 iu: we get fresh tuna and can our own. Egg yolk (1 yolk) 25 iu: my kids like egg salad, hard boiled eggs and deviled eggs. Shittake mushrooms (8 dried) 500 iu: My kids will eat these like candy, however some kids really enjoy them sauteed or try them in cream of mushroom soup. Soy Milk (1 cup) 200 iu and up depending on variety and brand (lite, regular, fortified, etc…). Whip up a quick cup of homemade hot cocoa, chocolate milk or blend into a smoothie with some blueberries and cranberries (both high in antioxidants). Missing nutrient- Magnesium (80mg 1-3 yrs, 130mg for 4-8 yrs, 240mg 9-13yrs). This nutrient is key to ad in the absorption of calcium. Magnesium and calcium are especially important to help kids (and adults) sleep at night, regulate blood sugar, and supports a healthy immune system among other important tasks. Children who are lacking in magnesium may demonstrate signs such as restless/twitching legs, they may not settle down easily at bedtime, they may be hyperactive, have bowel constipation issues, weakness and fatigue. Pumpkin seeds (2ounces) 300mg. This is an all time favorite in our house. Rinse, add a bit of oil and salt and bake until crispy. Almond butter (2 Tbs) 98mg. Opt for a almond butter & jelly sandwich, spread some on crackers or enjoy it in blondies and no bakes. Or just munch on an ounce of almonds for 80 mg. Sneak some spinach into recipes (1/2 cup) 75mg. Deceptively Delicious has tons of recipes that show you how to bake veggies right into your brownies and other tasty treats. Oatmeal is also a good source of magnesium (1/2 cup) 56mg. Try some oatmeal energy bars for breakfast, which also has banana, another source for magnesium providing 30 mg per medium sized fruit. Here’s a simple recipe that’s rich in magnesium, zinc and calcium. It works perfectly in our Laptop Lunch boxes for back to school. Process in a blender until desired consistancy. Enjoy with tortilla, corn chips, rice cakes, or???. Toss in a handful of roasted pumpkin seeds, some fresh veggies and an oatmeal energy bar for a nutritious and delicious lunch box! 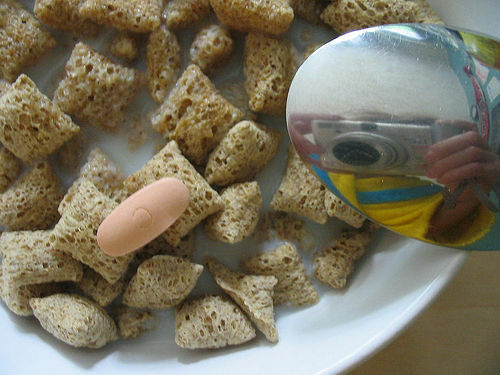 Photo Credit: Breakfast Self-Portrait by Anaulin on Flickr under Creative Commons License.